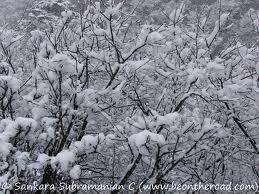 Last night, the season’s first snowfall was light to the touch, a soft carpet muting footfalls on the pavement. When struck by a shoe, it rose up in a powdery cloud, then settled silently into shimmering mounds. It lay upon the trees like raiment. Tonight it has changed, receded, hardened into crust and opaque patches of ice. Walking on it produces a loud crunching noise, rather unpleasant. One worries about disturbing the neighbors. Tomorrow it will change again, as Saturday shovelers clean their sidewalks and cars. Metal on asphalt, plastic on glass: the grating, scraping sound will rise up to second floor bedrooms and summon people harshly from their dreams. Later the landscapers will rumble in with their blowers, clearing driveways with a deafening buzz that feels to the ear as if it were drilling through the skull. In a few days or maybe weeks a rough winter rain will fall, clattering on the ice, and wash the last pieces of winter’s beauty into the storm drains. Then, once again, we’ll begin listening for the gentle hissing in the bamboo and watching the street lights for tiny falling stars of snow.